Modus Operandi: Chewing through wires, building geometrical shapes with reflective qualities, enters mammalian bodies by boring three holes into the flesh. Very intelligent and work in groups. End Goal: To overtake the Earth as the dominant species, or is it? Phase IV is the only full-length feature film from legendary title and credit master Saul Bass. It is such a visual masterpiece, that I wonder why he didn’t make another. For a sense of the sheer genius of design in this film, look here for a nicely organized series of screenshots. The strength of this film is its strongly visual style that, while certainly not subtle, is somehow capable of imbuing ants with a human depth without resorting to absurd baby-talk voice-overs. 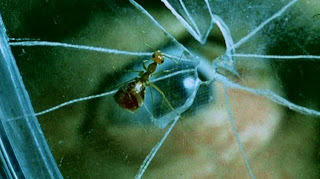 When the scientists use “100% yellow” pesticide defense, we see the suffering of a trapped ant mirrored in the motions of a trapped man. Watching the trials of a series of ants dragging back a chunk of pesticide to the queen so their little sisters will be immune is a touching display of teamwork, persistence and sacrifice. The funeral scene after a human counter attack is sad: dead ants laid out in neat rows, black-clad mourners with mandibles open in anguish and a choral soundtrack with creepy, ant-like squeals. Although these sequences are filmed by National Geographic’s Ken Middleham, their stunning anthropomorphism is a far cry from stale documentary fare. Although the ants steal the show, we have a nice pair of scientists and a younger gal to flesh out the human side of the story. James, the game theory grad student, remains humane and curious in his attempts to understand and communicate with the ants as Hubbs, the senior biologist, becomes increasingly mad, savage and keen to wage war. All told, what is intersting in this film is its atmosphere, implications and visuals, not its sparse, but interesting story. Phase IV stands out from the shlocky 70s crowd as a dignified, bizarre and artfully rendered sci-fi tale. Just so you know, although most of the conversations we humans have had with ants have been chemical, ants really do make sounds. Nit-picking Science: 1) Dr. Hubbs, millipedes don’t feed on ants; they eat rotting stuff. 2) That’s no queen ant! That’s a wasp in some sort of pregnant termite costume! Although I saw this film way back when--after seeing the screen shots referenced in your blog and reading your review, I'm anxious to see it again. Good blog! It's worth another go, now that it's been a little cleaned up for the DVD release. As fond of bug movies as I am, there are relatively few that could earn a full five out of five star rating from me. In fact, Phase IV and Them! are the only ones I can come up with so far, but hopefully I'll stumble across another someday! will be on par, but so far what I've seen of the shots, it can't shake a stick at Bass' work in Phase IV. If it ever gets an honest release, I'll let you know.